Over much of the Nineties, there was much talk of a third entry in the lucrative "Ghostbusters" franchise. Unfortunately, the lack of a good script and commitment from the original leads (Bill Murray, Dan Aykroyd, Ernie Hudson, and Sigourney Weaver) relegated "Ghostbusters III" to the realm of rumors, and the much-anticipated film never materialized. However, when it was announced that "Ghostbusters" director Ivan Reitman was going to be helming "Evolution", his first genre film in over a decade, there was a faint hope among fans that he would rekindle the magic blend of sci-fi and comedy of the original "Ghostbusters" film. 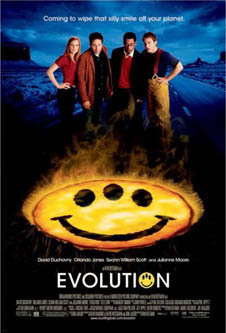 Unfortunately, though "Evolution" has its moments, the film never quite gels with its dull characters and bland humor. The story gets kicked off when a meteor crashes into the Arizona desert on the outskirts of the town of Glen Canyon. 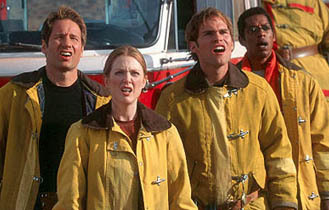 As a representative of the US Geological Survey, Professor Harry Block (Orlando Jones of "Double Take") of the local community college is dispatched to gather samples, who brings along his colleague Professor Ira Kane (David Duchovny, in his first film role since departing "The X-Files"), a specialist in biology. Their investigation quickly reveals that the meteor is oozing single-cellular organisms of extraterrestrial origin. However, an even more surprising finding is that these organisms have an extremely rapid metabolism, and are evolving into higher life-forms at an exponential rate (brought to life by visual effects supervisor Phil Tippett of "Starship Troopers" fame), turning an underground cavern into an alien ecosystem. However, before Harry and Ira can do further studies, the US military arrives, led by Ira's former boss, Dr. Woodman (Ted Levine of "Wild Wild West"), who confiscates their research, and cuts off all access to the meteor. Undaunted, Ira and Harry begin a crusade to help reveal the truth, which quickly escalates into a quest to save the world as the alien creatures continue to evolve and spread uncontrollably throughout Glen Canyon. Fortunately, they are helped by wannabe-fireman Wayne Green (Seann William Scott of "American Pie") and Dr. Woodman's assistant, Allison Reed (Julianne Moore of "Hannibal"), who comes to disagree with her boss' approach in handling the ever-escalating situation. 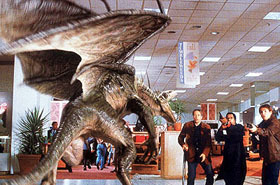 Essentially a cross between "Ghostbusters" and "Men in Black", "Evolution" has a great premise as a bunch of everyday guys try to stop an alien infestation. Unfortunately, this promising premise ends up being wasted on such a middling film. With the exception of Jones' character, who gets all the best lines in the film (including the classic "There's ALWAYS time for lubrication! "), the main characters are an uninteresting and unamusing bunch. As Ira, Duchovny lacks any enthusiasm or energy in his performance, which is quite evident in his supposedly romantic moments with Moore, which end up awkward and stilted. As for Moore, her big contribution to "Evolution" is the frequent pratfall, a gag that misfires repeatedly. Meanwhile, as the stoner-poolboy-who-wants-to-be-a-fireman, Scott seems to be out of place, as though he accidentally wandered off the set of "American Pie 2". Script-wise, "Evolution" does have a few sparkling moments, though they are few and far-between. In addition to Harry's 'internal' problems with a pesky alien bug necessitating the use of lubricant, there are some great gags where Duchovny makes a nudge-nudge-wink-wink reference to "The X-Files", Harry talks about the fate of African-American characters in these types of movies, and Wayne attempts to trap a flying alien in a shopping mall with karaoke. But the film's highlight would have to be the closing scene, which combines the excesses of product placement with the 'community service' messages that are usually tacked on to after-school cartoons. Unfortunately, this is probably the only time that Reitman pushes the comic envelope in "Evolution"-- if only this sort of irreverence had been applied to the entire film, which is instead littered with tired gags and comic misfires. "Evolution" may boast some decent special effects and some marquee names, but it certainly isn't as smart or funny as director Ivan Reitman's earlier successes in sci-fi comedy. Though it is admirable for trying to recontextualize the alien invasion movies of the Fifties with the comic sensibility of today, the film ends up being dragged down by a script that cares little for its characters and offers up humorless comic bits. Overall, "Evolution" ends up not being fit to survive. Images courtesy of Dreamworks Pictures. All rights reserved.